1. Paint two coats of white polish on your nails, and let them dry well. 2. Cut a map into pieces, either small squares, or slightly larger than your nails. 3. Dip a piece of map into rubbing alcohol for 5-10 seconds until it is completely soaked. Then place the map piece on your nail, pressing firmly for at least 15 seconds. 3. 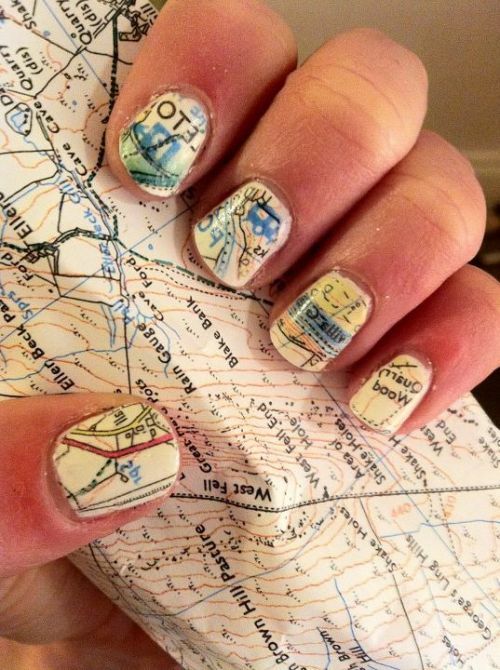 Gently remove the map paper, and the image will now be on your nail. If needed, you can clean off some of the map paper using a Q-Tip and rubbing alcohol. When finished, use a coat of clear nail polish.